After 5 weeks and a $700,000 renovation, Fenix has reopened it's doors. The menu divided in two - offering Degustation and Traderne (a la carte). The meal begins with a liquid nitrogen palette cleanser - Caprioska flavoured meringue cooked in liquid nitrogen. 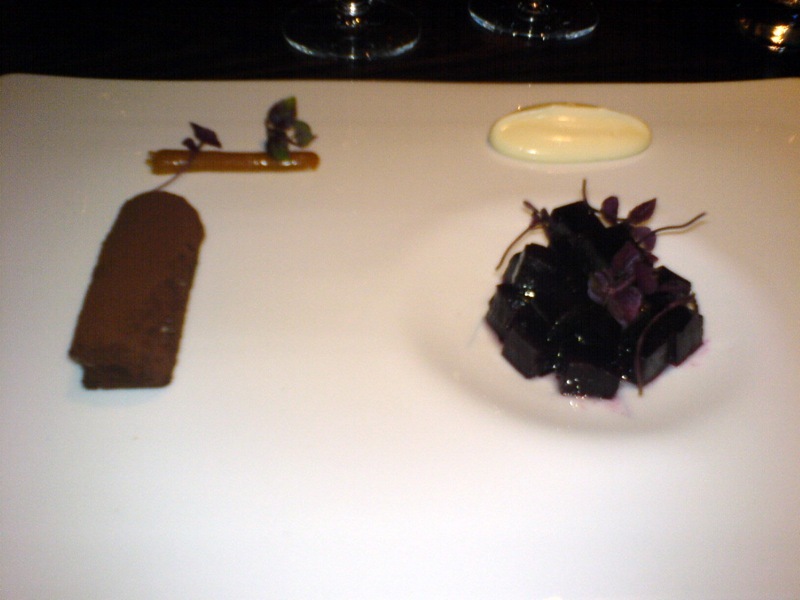 No photo as it's eaten as soon as presented. Butter - sprinkled with salt and thyme and a splash of olive oil. A play on a Twix bar - chicken liver parfait piped between wafers then dusted with cocoa, above it a strip of salted caramel. 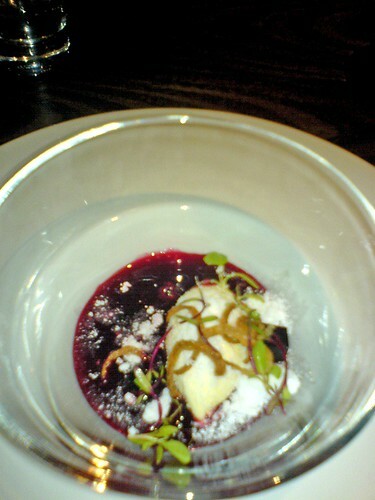 Cubes of just-cooked beetroot provide a counter to the rich parfait. 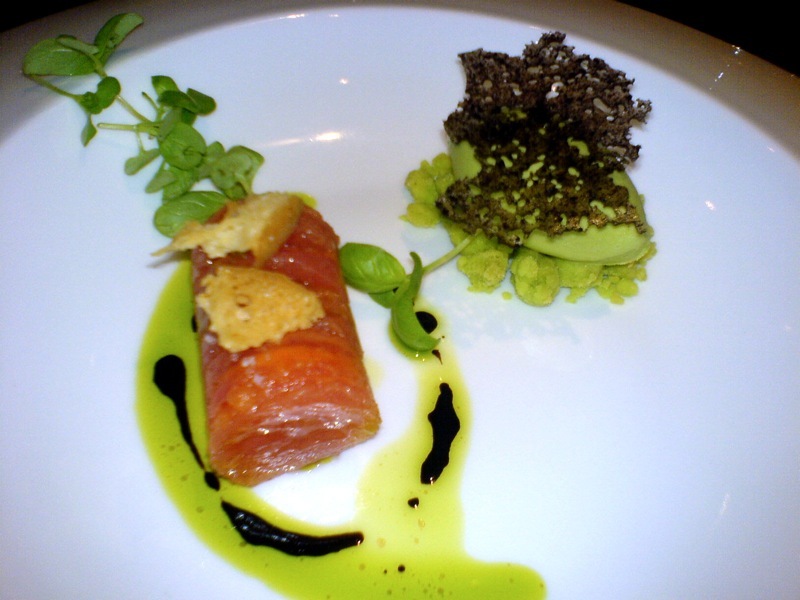 This dish is inspired presenting us with the absolute essence of tomato and basil. This would have to rank as an ultimate way of presenting these often combined ingredients. Ripe tomato flesh has been layered and pressed to create an intensely flavoured cylinder of pure tomato. 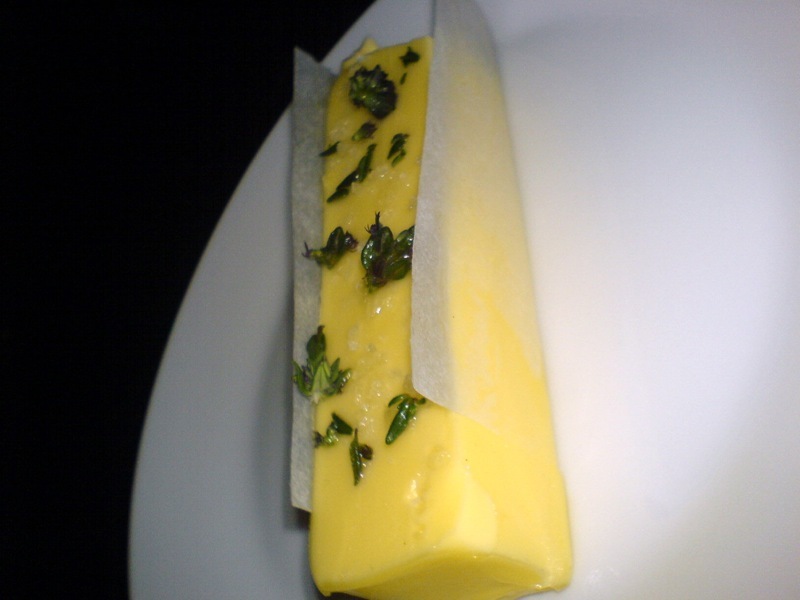 The basil rocks lie under the basil ice cream, they provide a crunch to contrast the silky smoothness of the ice cream. 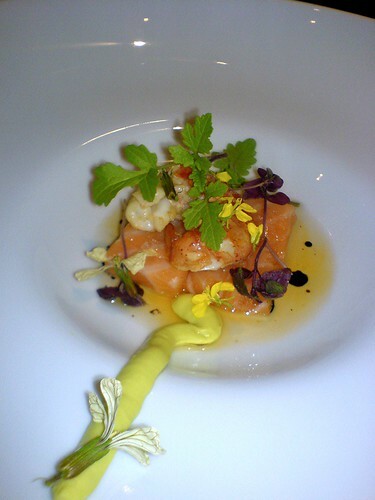 Often ignored in Australia yet prized in Japan, this dish presents salmon belly at it's best. Utilising the rich fatty characters of belly it's "cooked" confit style. The resulting flesh just melts in your mouth - it's flesh remaining uncoloured by the confit process. Under a leaf and on top of a warm grilled slab of cantaloupe, sits the kidney and liver of the rabbit. A wedge of just braised cabbage is drizzled in a verbena sauce. 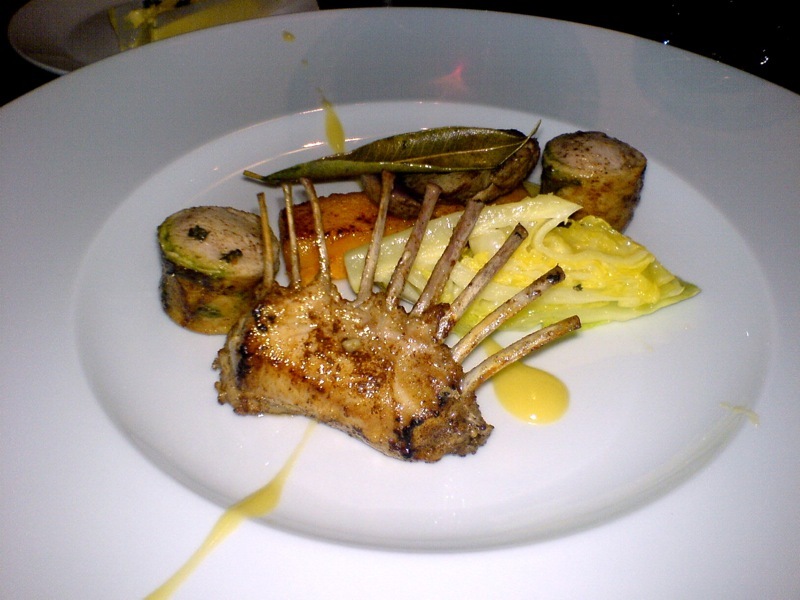 Along with the rack of rabbit, two discs of rabbit saddle. A most interesting combination to make you think - in a sauce of beetroot & passionfruit juice you'll find cubes of beetroot. The white powder isn't icing sugar but coconut dust. 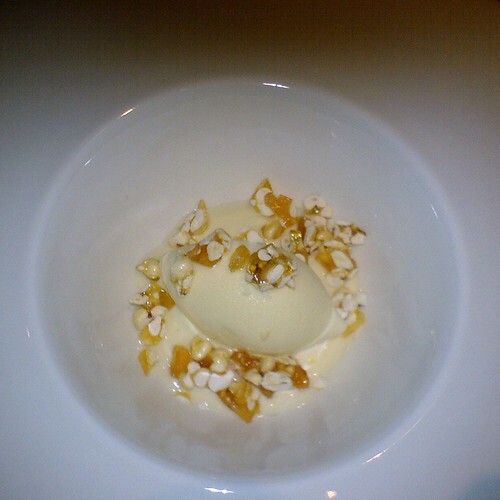 On top of quenelle of passionfruit sorbet are fried shallots. The dish is presented without the honey puffs - they come separately in a small sealed plastic bag - you get to sprinkle them. The milk sorbet is especially interesting. It's simply churned milk but the result is an intensely flavoured sorbet, more milky than milk, it more closely resembles the intensity of evaporated milk. This dish is served with an espresso-tini. 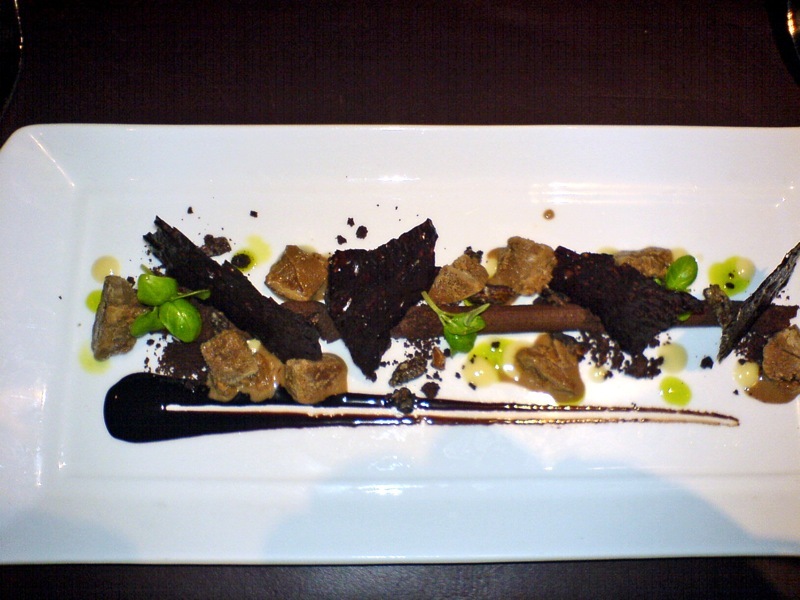 The piped line of dark chocolate mousse is surrounded by various textures of chocolate - chocolate bark is brittle, chocolate rocks are crunchy. Instead of using mint, micro basil leaves and basil drops are used.